Deutsche Post is reliable service provide for all your postal needs. Mail service is prompt and efficient in Germany. The goal is to have a Brief (letter), that was mailed in the afternoon, to arrive the following morning anywhere in the country, though this isn’t guaranteed. Most packages can be delivered within a four hundred kilometre radius in one day and nationwide within two days. Post offices are normally open Monday through Friday from 8 a.m. to 6 p.m. and on Saturdays from 9 a.m. till noon. In some areas outside cities, they may be closed from 1 p.m. to 3 p.m., and in large cities there are sometimes 24-hour post offices, generally at the main post office and/or at the railroad station. You can buy stamps from roadside stamp vending machine also. But you need to have change as it does not have facilities to return change. The Deutsche Post has simplified, and reduced prices for, sending international letters effective from 1 Jan 2011. Now the prices for sending post to Europe and any other country of the world is same. For a list of DHL's Price Changes as of January 1, 2011 Click here. It's in English!! 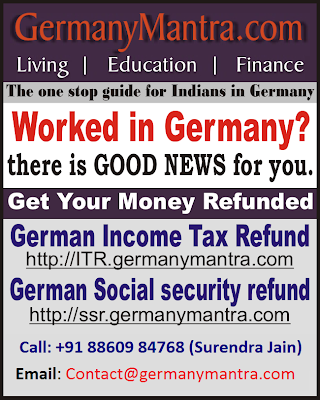 A redirection service is available from the German post office (Deutsche Post). You can request for this service at a post office or online. When you opt for this service, all your letters will be redirected to your new address in Germany or outside Germany.